Extremely quiet, easy to clean, just add tap water and essential oils, cool steam, no heat involved/no risk of burns, automatically shuts off, BPA-free, great for home, office or travel, fits in car beverage holder, run life of 5000+ hours, plugs into any USB port, rotating LED lights, run time of up to 6 hours. 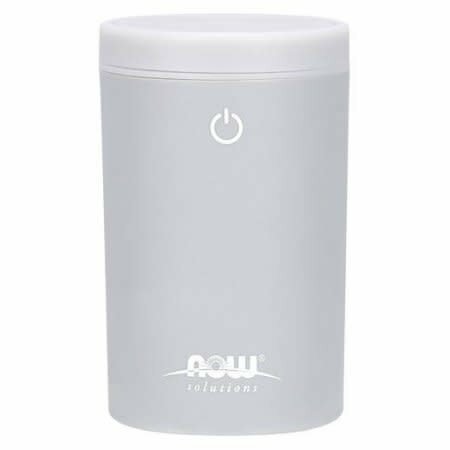 With NOW Solutions portable USB Ultrasonic Oil Diffuser you can enjoy the benefits of aromatherapy wherever life takes you. This compact little unit can be plugged in to any USB port, making it ideal for the home or office, and is perfectly sized to fit in almost any vehicle beverage holder for portability you just won't find with most other diffusers. With a run time of six hours per fill, NOW Solutions Portable USB Diffuser is a great complement to any on-the-go lifestyle.